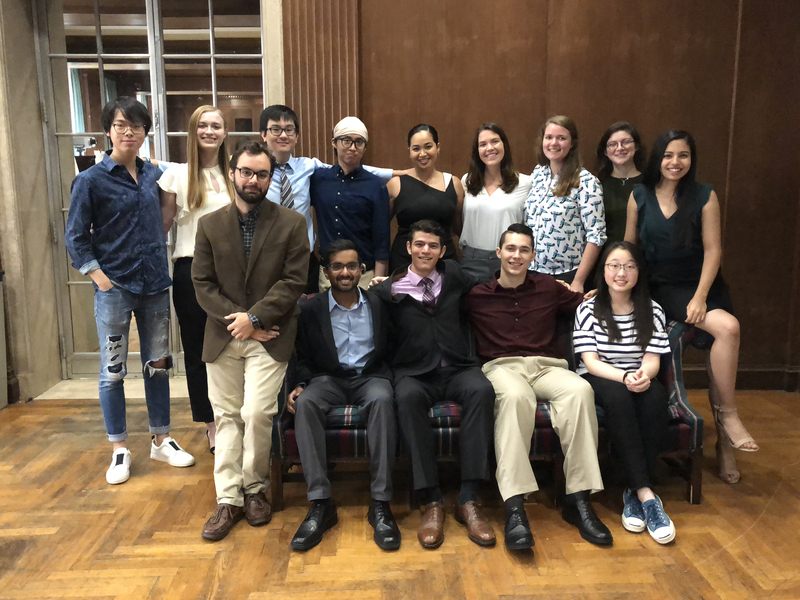 Below is the 2018 Summer Undergraduate Research Program in Neuro Computation (uPNC) class roster. Selecting the name of the student will take you to a short description the the student’s research and link to their poster. The 2018 Summer Schedule can be downloaded here (pdf format). Project Description: Momi Afelin was involved in the group’s project of developing EEG systems for coarse and curly (e.g. African) hair. It is well-known issue that African Americans are unable to use today’s EEG system without treating their hair by steaming it. Moreover, steaming only works for a few tens of minutes. 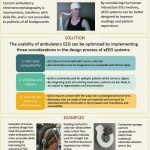 Because EEG is used in standard tests for epilepsy the issue is cause for significant clinical limitation. Momi designed a novel electrode for EEGs for thick and curly hair, which built upon electrode designs previously designed by students in the group. We are currently testing these newly designed electrodes on African American participants. Momi also worked on developing a wig for hiding EEG electrodes. This is particularly useful when someone suffering from a disorder (e.g. epilepsy) is being diagnosed using EEG, but does not want to reveal publicly that they are being tested. Project Description: When human subjects look at diffuse flickering light at particular frequencies, the visual field fills with geometric patterns such as hexagons, spirals and bullseyes. These so-called flicker phosphenes have been known about at least since Purkinje described them in his book. In a paper from 2011 Michael Rule (former uPNC student) and Ermentrout proposed a model for these based on the Wilson-Cowan equations that describe the behavior of a spatially coupled network of excitatory and inhibitory neurons. 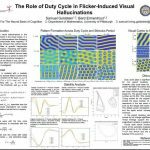 In this project, Sam Goldstein studied the effects of duty cycle (how long the light is on relative to how long it is off) on the stability of the cortical networks and also on how much the duty cycle affects the patterns that are seen in the model. We found that duty cycle has mixed effects on the stability — at high frequencies, the longer the light was on, the more the system became unstable while at low frequency stimulus, there was an optimal duty cycle for instability. For high frequency, the duty cycle had little effect on the patterns observed, while at low frequency, the patterns varied widely. Project Description: Previous work, including in Matt Smith’s Lab here in Pittsburgh, has shown that the correlation between spike counts from a pair of neurons tends to decrease as the distance between the neurons increases. In this project we examined the extent to which a similar phenomenon holds for phase coupling. Phase coupling refers to a consistent phase relationship in a pair of neural oscillations. Substantial circumstantial evidence has pointed to a role for neural oscillations in cognitive processes. Phase coupling of a pair of neural signals would represent a form of communication between the regions from which the signals were recorded. Quiana Jeffs analyzed local field potentials (LFP) from 96 electrodes collected with a Utah array in visual area V4 by the Smith Lab. LFPs were band-pass filtered at 15 Hz, corresponding to beta oscillations. We applied the widely-used phase coupling measure known as Phase Locking Value (PLV). We found a clear decreasing relationship of PLV with increasing distance between the electrodes. Please see the description of the closely related project of Joel Lee. 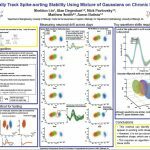 Project Description: Previous work, including in Matt Smith’s Lab here in Pittsburgh, has shown that the correlation between spike counts from a pair of neurons tends to decrease as the distance between the neurons increases. In this project we examined the extent to which a similar phenomenon holds for phase coupling. 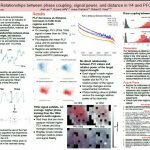 Phase coupling refers to a consistent phase relationship in a pair of neural oscillations. Substantial circumstantial evidence has pointed to a role for neural oscillations in cognitive processes. Phase coupling of a pair of neural signals would represent a form of communication between the regions from which the signals were recorded. Joel Lee’s project was closely related to the project of Quiana Jeffs. We analyzed local field potentials (LFP) from 96 electrodes collected with a Utah array in visual area V4, and another array in Prefrontal Cortex (PFC) by the Smith Lab. LFPs were band-pass filtered at both 10 Hz and 15 Hz, corresponding to alpha and beta oscillations, respectively. We applied the widely-used phase coupling measure known as Phase Locking Value (PLV). In both regions, and for both frequencies, we found a clear decreasing relationship of PLV with increasing distance between the electrodes. The relationship was not affected by total power in the signal. PLV was stronger in V4 than in PFC. We did not find phase coupling across the two regions.